In our unprecedented underwater-gaming issue, Squidward gets REALLY into roleplaying--as a 5th level Mer-Bard with a magic flute in "Serpents and Sealords." Then SpongeBob and Patrick meet the creator of their favorite tabletop game "Legends of Aquaria!" 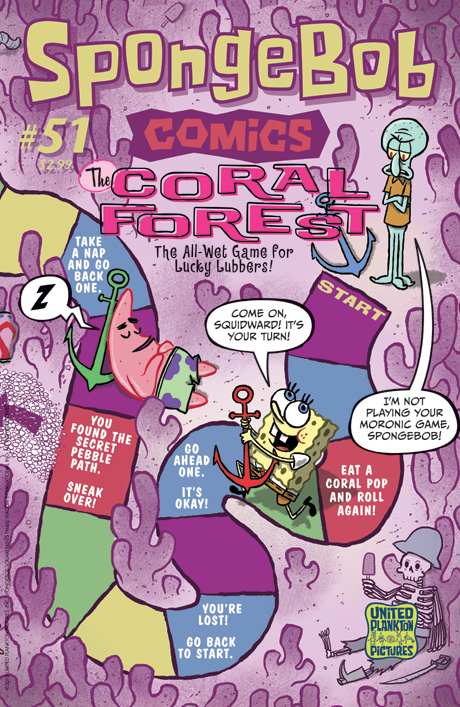 Plus, a SpongeBob pinball spread by Jon Chad (Leo Geo), a Bikini Bottom video game tale by Zac Gorman (Costume Quest), and a surreal sequential sponge story by Bob Flynn! All wrapped up in a cover by Graham Annable that's a playable SpongeBob board game!